September 23, 2015 — The U.S. Food and Drug Administration has announced the recall of Dingo Chip Twists “Chicken in the Middle” dog treats because it has the potential to be contaminated with amantadine. Amantadine is an antiviral human drug that’s not approved for use in animal food. The FDA has labeled this event a Class III recall. So, whether or not to issue a press release is left to the discretion of the company. The above image was copied in good faith from the company website. However, because we’ve been unable to reach the company by phone, we cannot verify the photo is an accurate representation of the affected product. 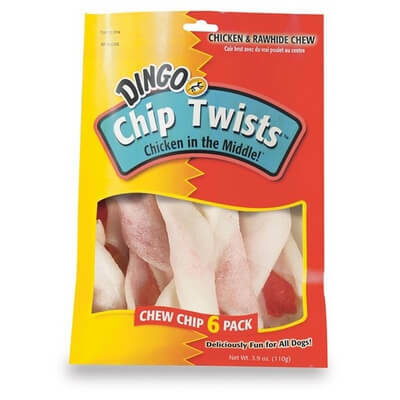 The affected product is called Dingo chip Twists “Chicken in the Middle” Dog Chew Treats and appears to include 2 different package sizes. The responsible name on the label is United Pet Group, Inc. Cincinnati, OH. The recalled product was made in China.